outside world. In such an emergency, you will find this intruder alarm to be very handy. It transmits a prerecorded emergency message repeatedly for reception by an FM receiver. The message containing address, geographical location, name, etc is recorded onto a chip. The prerecorded message can then be transmitted repeatedly with the help of an FM transmitter, in the hope that some noble soul will hear it and inform the police about the incident. The circuit comprises a sound recording- and-playback chip (UM5506BH). This chip consists of a 96kbit SRAM and can record up to six seconds of audio. 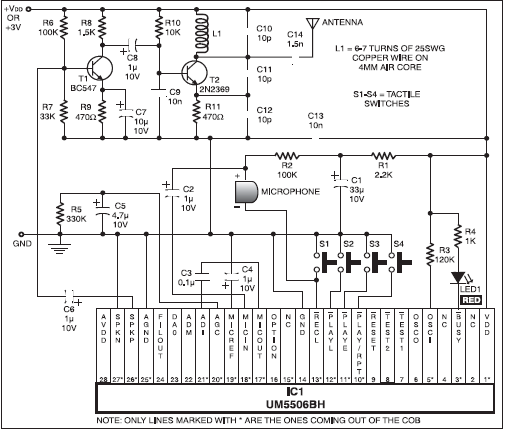 (For details, refer ‘Mini Voice Processor’ circuit published in April 2000 issue of EFY.) After the required message has been recorded, it is passed to a low-power, VHF FM transmitter wired around BC547 and 2N2369 transistors. The range of this transmitter is 60 to 100 metres using a 40-70cm long wire as an antenna. The major advantage of this circuit is its low power consumption. The author operated it on 3V button cells (Maxell CR 2032, CR 2025, etc used in digital diaries). To transmit the prerecorded message, the play button is pressed repeatedly. 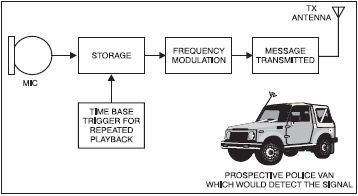 The transmitted message can be heard over the FM receiver. A possible modification, though it has legal complications, is to vary the coil inductance such that the transmission is on police band, thus alerting the police for quick help. Even the need of repeatedly pressing play button can be obviated by configuring an astable multiviberator (using IC 555 timer) to trigger IC UM5506BH every six seconds so that the message is played repeatedly. This circuit costs around Rs 200.